It's a tumultuous time to be in retail. With digital-first brands and disruptors dominating the landscape, legacy brands continue to struggle to innovate—and survive. As consumer expectations and desires rapidly shifting and evolving, how are brands meant to survive? Our new research shows that when brands look beyond transactions and deliver value through emotional drivers such as time, access and recognition, they unlock the potential of long-lasting loyalty, and thus, survival. 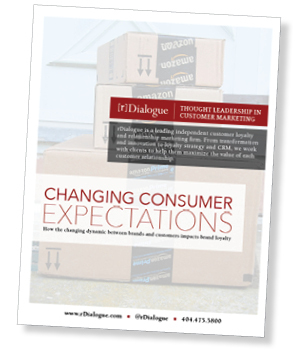 Through the research study, we began to uncover how brands, like Amazon, are leading the way and in turn, changing consumer expectations for the better. This on its own presents a significant challenge for most other brands. As of 2017, Amazon Prime has over 90 million members in the United States; this is a staggering number all on its own, but even more so when you take into account that this number has doubled in just two years. With so many American adults signing up, how can brands possibly compete when Amazon is already so far ahead? Expectations for how brands engage with customers are increasing, and we believe Amazon is playing a significant role.